The Management System is the administrative web interface provided by AxCMS.net where editors can create, manage and publish web projects. Web editors are able to add and maintain web site content in the Management System separately and independently from the live version. When the editor has perfected a new version, it can be published to the Live System, where it becomes available to the end-users. The Live System is the web environment that the end-users interact with. The Live System usually runs at a remote data center (for internet applications) or on a separate web server (for intranet applications). Both MS and LS are Web Applications (deployed physically either as separate Web Sites or virtual directories in the same Web Site in IIS). Communication between MS and LS occurs via WebServices. PublishService is the name of the component which hosts WebServices (not only those for publishing). PublishService can also be either a Web Site or a virtual directory on IIS. The publishing process is purely a one-way communication - from MS to LS and never in the other direction. AxCMS.Service is a very important underlying component of AxCMS.net. 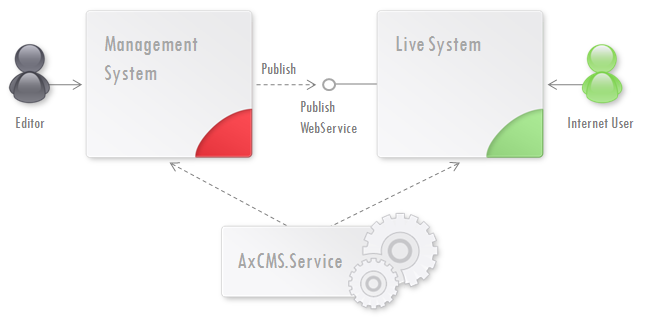 It is a Windows Service which allows asynchronous execution of tasks in AxCMS.net. The tasks vary from generating HTML-snapshots for web pages during publishing process to sending out newsletters, to name a few. These components can be deployed to your production system in a number of ways, as described in the article AxCMS.net Deployment Alternatives.